Once Steve Alford completed his opening monologue during his introductory press conference at UCLA nine days ago, it didn't take long for the topic of conversation to turn to the darkest chapter of his coaching career. A reporter from the Orange County Register asked Alford about his vehement defense of Pierre Pierce in 2002 after the Iowa standout was accused of sexual assault. Alford came under fire for repeatedly declaring his player innocent, especially after Pierce pleaded guilty to a lesser charge and later was thrown off the Iowa team after another incident involving a woman. Had Alford responded with tact and humility by noting his instinct was to defend his players but he made a mistake in that instance that he has since learned from, he could have quickly diffused the situation and put it behind him again. Instead he kept it in the news cycle with a defiant response in which he seemed to reject the notion that he made it more difficult for Pierce's accuser. "All I can tell you with that situation is that I followed everything that the University of Iowa administration, the lawyers that were hired – I did everything I was supposed to do at the University of Iowa in that situation," Alford said. "I followed everything I was told to do." 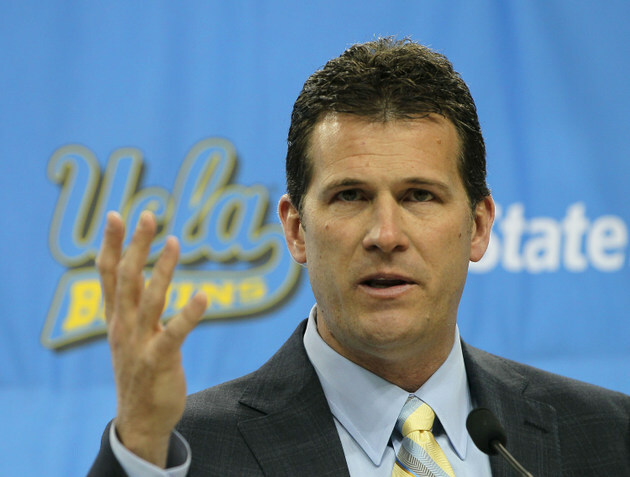 The result of Alford's response has been that coverage of the first nine days of his tenure has focused as much on an incident from 11 years ago as it has on his efforts to rejuvenate the UCLA program. A Chicago writer penned a column about the coach's comments under the headline "Alford already lying at UCLA." A reporter for the Iowa City Press-Citizen revealed that his niece felt threatened by Pierce during a 2002 run-in but both Alford and other school officials ignored the complaint he filed. And UCLA fans, some of whom were already skeptical of the Alford hire, used the controversy to further question if he was the appropriate choice to replace Ben Howland. In response to the criticism, Alford issued a statement Thursday finally admitting he made mistakes in how he handled the accusations against Pierce. "At that time, I instinctively and mistakenly came to [Pierce's] defense before knowing all the facts," Alford said. "I wanted to believe he was innocent, and in response to a media question, I publicly proclaimed his innocence before the legal system had run its course. This was inappropriate, insensitive and hurtful, especially to the young female victim involved, and I apologize for that. "I have learned and grown from that experience and now understand that such proclamations can contribute to an atmosphere in which similar crimes go unreported and victims are not taken seriously." This statement from Alford is spot-on both in tone and content. The problem is he should have said this nine days ago. Because he responded the way he did off the cuff and then waited so long to release this statement, it comes across as being crafted by a publicist rather than being heartfelt. A segment of UCLA fans have questioned whether athletic director Dan Guerrero delved into Alford's background sufficiently before hiring him, but that criticism is unfounded. Guerrero has said repeatedly he was well aware of the Pierre Pierce scandal when he made the hire and given his reputation for being methodical and detail-oriented, it's a safe bet that's indeed the case. "Everyone has regrets in their past, but acknowledging them and learning from them shows true character," Guerrero said in a statement Thursday. "I was aware of this situation when we hired Steve and concluded that although he made an error in judgment 11 years ago, he had learned and grown from that experience. Our evaluation was based on his entire career, both on and off the court, and that is what led us to make our decision that he was the right coach for UCLA." What Guerrero probably wasn't expecting, however, was his new coach to flub the first question he received about the Pierce scandal so badly. All this easily could have been out of the news cycle days ago. Instead it has been an ongoing headache for those at UCLA for more than a week.